Yet more of drip-glazed Pates Pottery. This incantation is the clog- that beloved symbol of the 50s when cultural differences were represented by national costume. [Mexicans wear sombreros! Japanese wear kimonos! Those crazy Dutch wear clogs!] The clog also represented the allure of international travel- which from Australia in the 50s was no mean feat- it meant six weeks on a boat to anywhere. No respectable knick-knack shelf of the modernist house would be without one! Like the Pates pieces posted below, the colour tones here are pinks and greens, with crimson. Each one hand glazed- each one different. Other tones I have come across are yellow/brown, and brown/green [these came later in the 60s.] The production of the iconic clog went on until the early 70s. 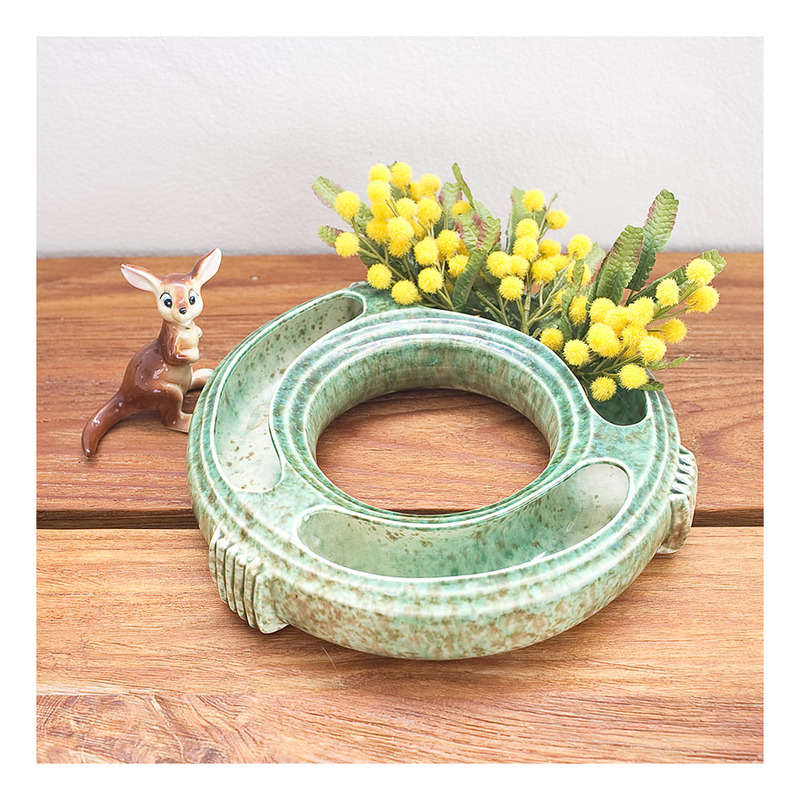 This fantastic planter was made by Pates Pottery, which operated out of Belmore, Sydney from 1946 -1990. As you may have noticed, given the tenor of the posts of this blog, being a Sydneyite I have an affinity for the potteries that were producing domestic ware in the 40s, 50s and 60s. Pates’ designs and colours were influenced by the 1940s art and interior design trends; and produced work with this ‘Australiana’ colour glaze- brown and green – apparently reminiscent of the Australian bush. This nationalistic colour combination was very popular, and since I am a landscape architect, and quite fond of the Australian bush, I have tended to collect Pates’ pieces in this colour range. I have another pair of Pates planters, in the same shape but a different ‘colourway’ on the blog – you might like to check out. This large planter looks fantastic supporting a range of succulent plants: I would advise keeping the succulents in their pots and styling them like cut flowers. 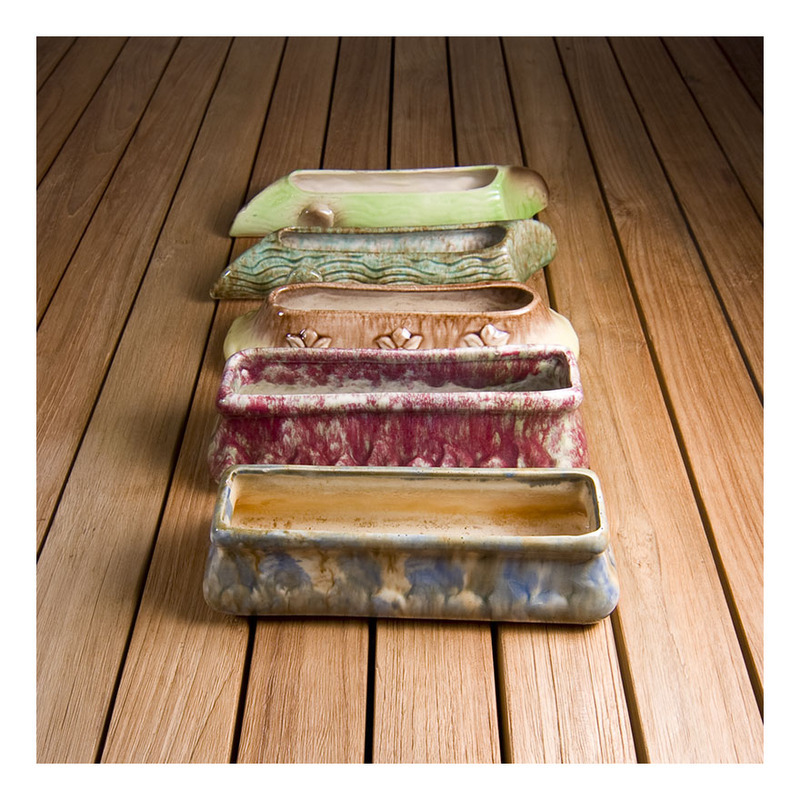 The large planter is for sale: $AUD45 – buy now for Christmas! I have waxed lyrical previously about my love of the ‘Australian’ green and brown hues of Sydney pottery of the post-war period…and here are some more examples from my collection. Pates pottery operated out of Belmore- an industrial suburb of inner-Sydney, from 1946 and only ceased production in 1990. Here is a selection of Pates vases in brown/green hues; two ‘lotus’ vases and a ‘log’ vase. Like many Pates vases, these shapes came in a variety of colours to suit the late 40s, early 50s décor. I decided my personal collection would be these ‘Australian’ colours [reminiscent of the bushland] – rather than the baby blues and powder pink or pastel yellow tones; but have rather too many to use or display now. Pates Pottery operated out of Belmore, Sydney from 1946 -1990. As you may have noticed, given the tenor of the posts of this blog, being a Sydneyite I have an affinity for the potteries that were producing domestic ware in the 40s, 50s and 60s. Pates’ designs and colours were influenced by the 1950s furnishing and domestic colour trends; and like Diana pottery – another Sydney pottery operating between the wars [and examples of which are in a couple of posts below] produced vases in baby blue, powder pink and pastel yellow. Pates, however, also continued to use a dual- drip coloured glaze– as evidence in these four vases. The quite deco-shaped vase in front is a wall vase: designed to be hung on the wall and filled with flowers. The swan and fish-shaped vases are very typical of the animal themed vases made in the 40s. And the last posy vase has restrained deco-shaping; it’s an attempt to transition from the 20s to the 50s. This fantastic planters was made by Pates Pottery, which operated out of Belmore, Sydney from 1946 -1990. As you may have noticed, given the tenor of the posts of this blog, being a Sydneyite I have an affinity for the potteries that were producing domestic ware in the 40s, 50s and 60s. Pates’ designs and colours were influenced by the 1940s art and interior design trends; and produced work with this ‘Australiana’ colour glaze- brown and green – apparently reminiscent of the Australian bush. This nationalistic colour combination was very popular, and since I am a landscape architect, and quite fond of the Australian bush, I have tended to collect both Pates pieces in this colour range. These large planters look fantastic supporting a range of succulent plants: I have kept them in their pots inside the planters and styled them more like cut flowers. I love the colour combinations. I told you I liked 50s swans! Following from my last Pates post, here are two small swan vases, and a posy vase. 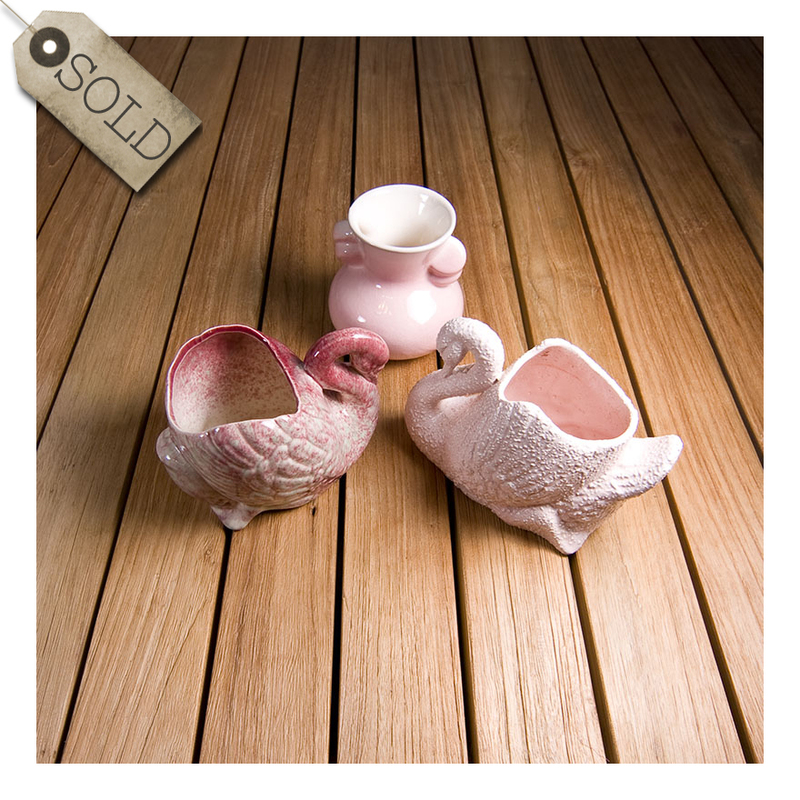 The swan on the left is similar to the large swan planter of the previous post- drip- glazed in 50s pinks & crimsons. The swan vase on the right is identical in shape but has a pastel pink and textured over-glaze. I’m not sure which one I like best- but that textured swan is surely the kitschiest. The posy vase came in a number of sizes; this being the smallest. It’s also pastel pink, with a clear glaze finish to both the exterior and interior: the interior showing the clay colouring to its best advantage. Meanwhile the two swans have the same internal colourings as their exterior.